Addis Ababa is a beautiful city of close to four million people, sitting at about 8000 feet above sea level. It is a city of beautiful people, lovely views, great food, and cultural richness. Ethiopian people seem to love Ethiopia (maybe that sounds obvious but there are many people who don’t like their own country). We have heard a number of Ethiopians tell us that if they were given a chance to live anywhere in the world, they would choose Ethiopia. That tells you something about this place. 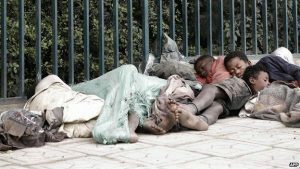 Predictions are that Addis Ababa will be a city of more than six million in the near future.Addis Ababa is a city with more than 100,000 homeless people, and at least 18,000 of those are children under the age of eighteen. 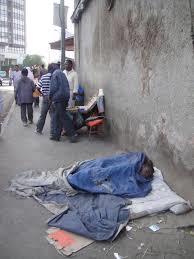 People can be seen sleeping on the sidewalk everywhere, every day. 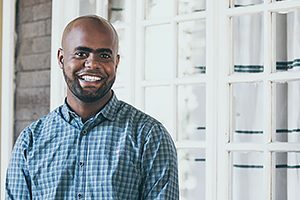 One of DML’s partners in Ethiopia is an organization called Kibir (http://www.kibirconsultants.org), which means “glory” in Amharic, who is doing just that – creating job makers. Kibir is working in a number of different areas, and they took us to visit one special partner this past week. A businessman, in his mid-thirties, who owns a construction and a catering company, felt the call of the homeless on his life. He decided to start a ministry that would daily feed breakfast to the homeless youth and lunch for homeless adults. While we were visiting, about 20 pre-teen and teen boys were there for breakfast. About 80 adults show up for lunch daily. Showers are provided, as is a laundry area where they can wash their clothes. The gospel message is shared at every meal through a full-time pastor who has now worked in this ministry for six years. The work is very challenging especially with the youth, Pastor Jeremiah shared, as it can take years to develop a relationship to the point where they will change their living situation.